A fascinating plant from Chile, Latua pubiflora is sometimes given the common name of ‘Tree of Wizards’, or ‘Sorcerers Plant’.. 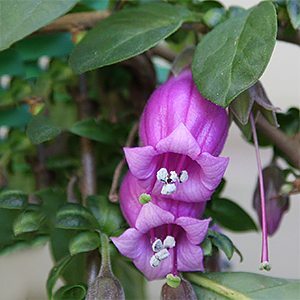 It is rare in cultivation, hover the bell shaped flowers, flared at the mouth and a vibrant purple to magenta in colour are very attractive. Over time Latua pubiflora will grow into a small woody shrub, usually spiny. All parts of the plant are regarded as poisonous. It is the only plant in the genus, and is grown for the showy flowers that appear in late winter to spring. In cultivation usually reaches around 2 metres in height, however in good conditions in will reach 3 – 4 metres. The flowers appear sequentially, so the flowering period is reasonably long. Pruning is best carried out immediately after flowering, it can be pruned after flowering to maintain size. Every 4 – 5 years it can be pruned right back the ground. This helps regenerate the plant, it will produce strong new shoots after pruning this way. Use it as a feature in the garden for its flowers or as a barrier or hedging plant. It is best plated away from pathways in case the thorns become a problem. Best grown in a humus rich soil, morning sun to part shade in the afternoon.